Fun, but not goofy, Olivelawn was the first of two outfit, that brought O s0me prominence, if not nationally at leas southern California. 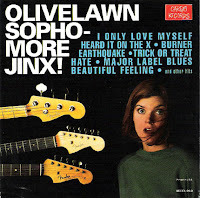 Their debut full length, Sap, no to mention some early singles did Olivelawn justice, but weren't quite as representative as the pulverizing followup, Sophomore Jinx! For all intents and purposes, Sophomore, was a...umm....grunge album. Yes and a damn solid one at that, cast firmly in the mold of their Seattle contemporaries Tad and Mudhoney. All the ingredients are here - heaving slabs of monster-truck riff-ola, a penetrating rhythm session, and of course an engulfing swath of angst. They were one of the most underexposed and unsung power-trios of the '90s, but akin to bands of the period like Overwhelming Colorfast, fluf inadvertently filled the void left by Husker Du, and Barlow-era Dinosaur Jr. With an unwavering punk foundation O and fluf, never met a hook they didn't like. Their are some great fluf albums and eps out there, and though they're out of print, they aren't difficult to obtain. Considering how vocally O has bemoaned the demise of vinyl over the years, I decided to rip Wasting Seed direct from wax, all glorious 10" of it. The songs here can also be found on fluf's Mangravy CD. Last but not least, this post will concern the little known O solo 7" ep on Goldenrod Records. 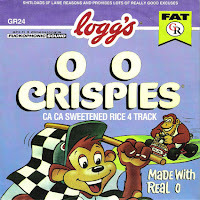 O. O. Crispies is about as close to unplugged the man gets (and it certainly ain't emo). You can definitely say It's a departure....not that there's anything wrong with that. For the truly devoted only. Although not a frontman, O is also a member of a full-throttle, first-class power pop trio, Reeve Oliver. It would behoove you to buy their self-titled album on the Miltia Group label, and while you're at it, check out their Myspace page. These uploads are just a tip of the iceberg. Do some further invest-"O"-gating, if you're so inclined. The links are the titles above. No password. I am an enormous fluf and Olivelawn fan and was surprised how quiet O was when I met him at SXSW a few years back. When I asked about all of his previous bands, he seemed genuinely flattered that anybody ever cared. Olivelawn rocked. They formed in my hometown where, when originally developed required that every house have an olive tree in the front lawn and the local cemetery bears the name 'Olive Lawn'. The only member of the band to reside there was their multi-talented drummer, now Guitar-god/frontman of Nebula, Ed Glass. Thanks for saving me the trouble of converting my vinyl.